The messy closet. It’s something we take for granted. While closets vary in size and content, one thing that they have in common is that they become messy very easily. The same goes for dresser drawers. We get crazy and do spring cleaning and get everything organized but then fall back into our old habits – like getting dressed out of the dryer. This week in the Organized Life Series, we’re going to develop a clothes system that is easy to use and convenient to keep organized. The steps we’ll be taking this week are specifically laid out for a single woman with no kids, but can be adapted for a man, child, or family wardrobe. Size – Women (and men) that have lived long enough tend to accumulate several sizes in all their clothing. There’s the “I used to be this size 10 years ago and want to get there again” clothing hiding in a box under the bed. There’s the larger-sized “Uh-oh, my regular pants don’t fit and I need to lose 5 pounds” pants. I know several women with thyroid problems whose weight fluctuates when their thyroid gives them trouble and need to jump back and forth between 2 sizes. Style – You may have a dress or top that looks beautiful on you, but is extremely out of fashion. If you need some tips on what’s in fashion right now, I recommend InStyle Magazine. You can check out their articles online or subscribe to the magazine. You also need to be aware of what looks good on you. Do you have a long torso? Wide hips? Large/small bust? Dress appropriately for your body. InStyle has some great tips for that. Color – Be aware of what colors look good on you. Just because you like pink doesn’t mean it is flattering. If you don’t know your color season, you can find a local consultant or get a generalized quick-check on The Chic Fashionista. 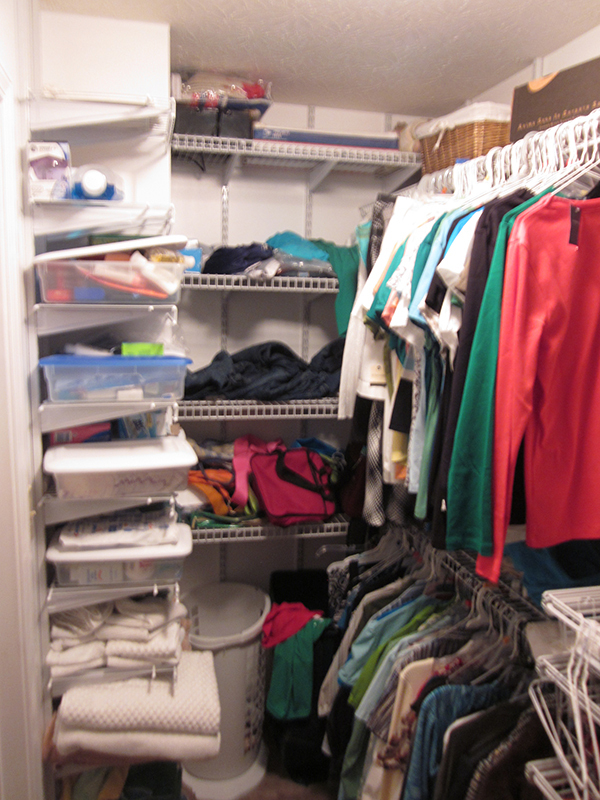 Season – If you have a large closet you may be able to keep all your clothing in one place. Most people store their alternate-season clothing in another closet or under the bed. In the winter, you don’t need many tank tops, swimsuits, or shorts. In the summer, you can pack away your sweaters and heavy coats. Purpose – Your clothing needs a purpose. Don’t keep something just because you like it if you never wear it. Work Clothing – Did you use to work outside the home but are now a stay-at-home mom? Are you about to enter the workplace? Are you changing jobs or careers that might require a change in wardrobe? Or do you find you’re wearing the same handful of clothes every week to work? It might be time for a change. Party Clothes – Do you go out every weekend and have lots of fun and trendy clothing? Or do you panic when you get invited to a party because you don’t have anything to wear? Make sure you have a few basics in your closet and some fun accessories, or rotate out old party clothes. Exercise Clothing – If you have been meaning to hit the gym but can’t get motivated, sometimes having the right clothing can make a difference. Of if your old clothes are looking rough, it might be time to replace them. Housework Clothing – These are the scruffies you use to do yard work, paint, or work in the garage/attic. You need to keep a few pieces of old clothing that you don’t mind getting ruined. Relaxing Clothes – When you don’t plan to leave the house or do anything on a Saturday, you want something comfortable. Your favorite shorts and tee or some comfy sweats fit the bill. Sleepwear – Depending on your sleeping habits, you may have some old pajamas that need to be replaced and evaluated. Underwear – Make sure you have underwear that is in good condition (would you want the ambulance driver to see you in it?). It needs to fit properly – especially bras. You need to have the right underwear to use with all of your clothing. For women, some dresses and tops require special underwear. This is a good time to evaluate. What are you going to do with your clothes? 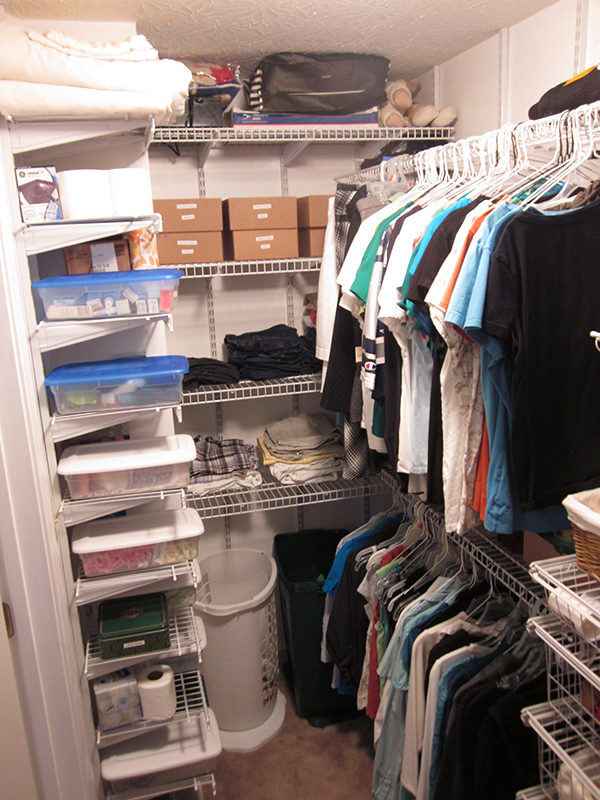 Keep and Organize – As you sort, neatly organize your clothes into the categories of your choice to be put back away. Give to Charity – Good or excellent quality clothing can be donated to charity. I HIGHLY recommend that you do this rather than selling items. Check out itsDeductible.com. This is a site owned by Intuit – the Turbotax people. You can log into the site and document your donations. It will give you a dollar amount for your items and will import nicely into TurboTax when you do your taxes at the end of the year. Consider this – to sell a pair of jeans at a garage sale, you will probably get between $0.50 and $2.00 for them. If you donate them, you get $8.00 off your income, which means you’ll get about $2.00 off your tax bill. And you help a charity! Just make sure you document everything well. Sell – I don’t like selling my clothing. It’s a pain. Even selling it to a consignment store is a hassle and they rarely even buy half of what you take it. But if you like to do that, make a pile for it. Throw Away – You can’t sell or donate anything that is stained, damaged, or has holes in it. (Or at least you shouldn’t.) Have some bags for things going to the trash. Pretend that you have no clothes and have to purchase an entirely new wardrobe. What do you really need? You don’t need to be extremely specific, but make that list. Here’s a fun article from Real Simple: Wardrobe Basics Checklist. I made my own list that you can alter to suit your needs. 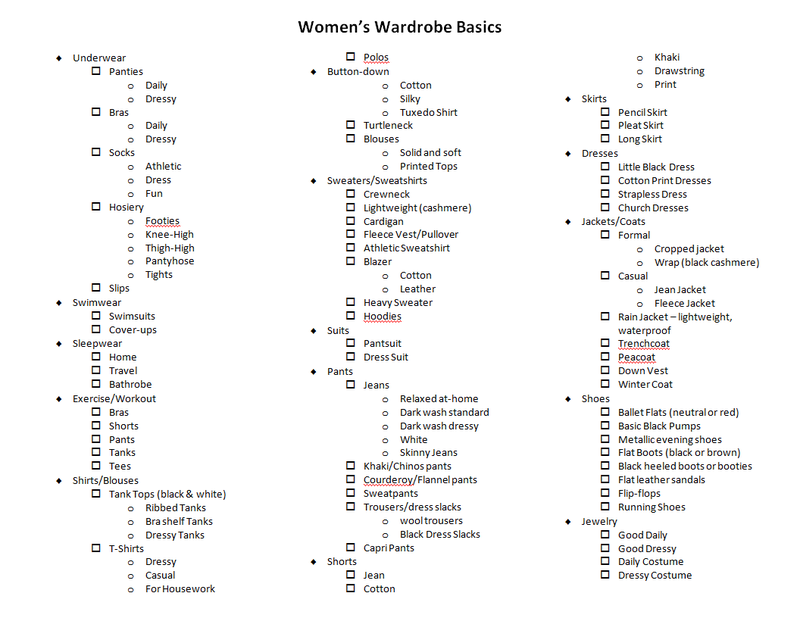 Here’s the Wardrobe Basics PDF for printing or the Wardrobe Basics Word Document to download and edit. I recommend starting with the drawers – your dresser and chest. After you finish with the closet you’re going to be worn out and you may decide to leave your drawers for later. Do them first and get them over with. Pull EVERYTHING out and pile it on your bed. Wipe out your drawers and have a screwdriver handy to tighten knobs and drawer handles. Then get started on sorting. Consider what should be in your drawers: Underwear, Swimwear, Sleepwear, Workout/Exercise clothes, Clothes for Relaxing, Housework Clothes, Shorts, Jeans, and T-shirts. If you have lots of drawer space, you may have sweaters in there as well. Have a trash bag handy for items that need to be thrown away. Have some cardboard boxes handy for items that will be donated. At some point during the donation process, it’s a good idea to photograph and list items for donation. You can do that now or later. I suggest doing it later. We have enough to do now. There are several things that define good clothing organization. Can you locate items easily? Are they stored so that they won’t get damaged? Is it easy to put new and clean clothes away? Bras – Bras need to be stored neatly in a deep drawer so that the cups and underwire do not become misshaped. Socks/Hosiery – If there’s a particular type of sock that you wear all the time – like low-cut athletic socks or black dress socks, I recommend that you buy multiples of that sock in the same brand. That way, matching becomes simple or unnecessary. When you do laundry, just match your different socks and dump all of these into a drawer. For your odd/fun socks and hosiery, a sock organizer like that shown above is a great idea. Slips/Specialty Underwear – I recommend having a separate drawer for your slips and specialty underwear like strapless bras. Swimwear – If you have the drawer space, put your swimsuits and cover-ups in a drawer. Otherwise, this is a great seasonal item to store elsewhere. Sleepwear – Even if you don’t use this on a daily basis, you do need a cute set to take with you when traveling or staying at a friend/family member’s home. Exercise Clothes – It’s good to have a drawer set aside for these items. Do not hang spandex in the closet since it can stretch out of shape. 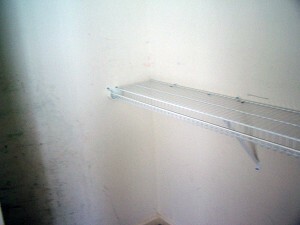 T-Shirts – even if you hang your nice tees, you will probably need a drawer for your other t-shirts. Think of how many free tees you have gotten for giving blood, volunteering, or running a 5K. These tees are great for lounging around the house. Here’s Martha Stewart’s instructions on How to Fold a T-shirt. This method is quick and simple and helps your t-shirts to remain wrinkle-free in the drawer. HouseWork Clothes – It’s a good idea to keep all these items together in a drawer, or even under the bed. These are the stained and beloved old clothes that you wear for painting, yard work, crafts or other dirty chores. Shorts – Regular around-the-house shorts and casual shorts. Super-nice shorts should be hung with trousers. Jeans – If you don’t have the drawer space for jeans, you can hang them or fold them in your closet. Once your drawers are done, it’s time to organize your closet(s). 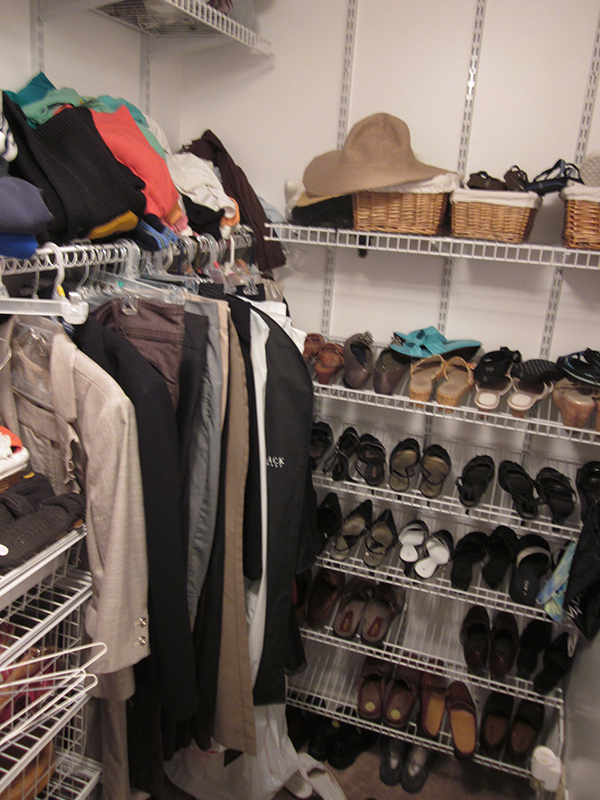 Don’t forget to organize any closets where you are storing seasonal clothes as well as your coat closet. If you have a lot of clothes in your closet, you might not want to pull everything out at once. 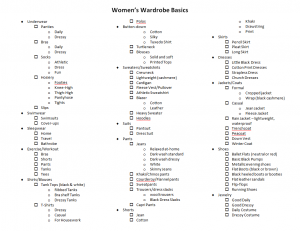 If this is the case, pull out items by category: folding, shirts, pants, skirts, dresses, shoes, accessories, etc. Decide what organization is most useful for you. If you wear business attire 5 days a week and dress up to go out every weekend, you’ll need to organize differently than someone that wears business casual to work and relaxes on the weekend. Whatever you do, the clothes you wear most often should be the most accessible. You should be able to pick out outfits easily and putting things away after they are washed or dry cleaned should be intuitive. Here are some things to think about as you plan how you want your closet to be laid out. Space – is your space well-organized? 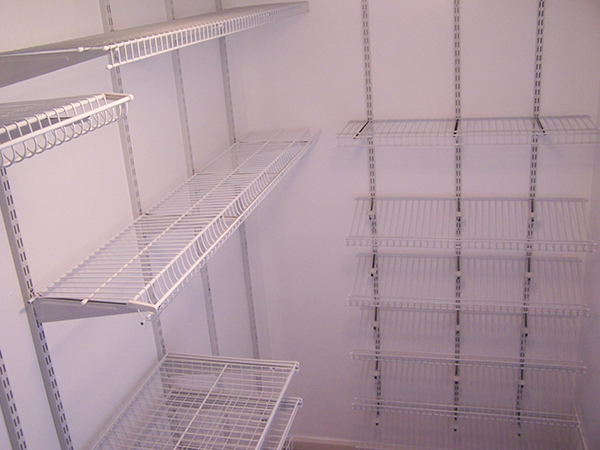 Do you have enough shelves and hanging racks? When I bought my house, I was excited about the huge master closet (10ft x 5ft). But the space was extremely wasted with just three hanging bars – 1 high and 1 low on the left; one normal-height on the right. I organized my closet on paper then took great measurements and went to my local home-improvement store where I bought the wire closet shelving and had it cut to order. I then installed it myself. I now have a full linen shelf, a wall of shelves for my folded clothes, the same 3 hanging shelves (1 high, 1 low, 1 med), and a wall of shoe shelves. Create a “basics” section that has basics that will always look good – good jeans, basic slacks, blouses, or shirts in neutral colors. You can grab anything from this section and add some colorful accessories. Create a “novelty” section filled with colorful or stylish items. Then grab one basic and one novelty and throw together an outfit quickly. Organize Hanging Items – Decide what works best for you. For example, you might want to hang blouses by type, then sorted by color within that type. Keeping like items together makes it easier to plan outfits. You may sort all suit pants together and all suit jackets together, or you may sort by paired suits. Keep dressy slacks together and casual pants together. Either hang pants by the waist on clipping hangers or fold them over a slacks hanger. Folded Items– Items that will stretch out of shape (like sweaters) should be folded neatly on a shelf or folded in half and draped over a hanger. 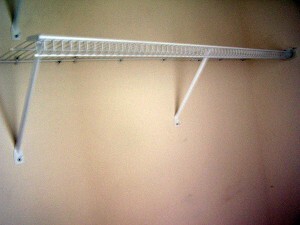 Hanging racks and shelf dividers are extremely useful for this. Organize by type and then color. Additionally, if necessary, organize by size. 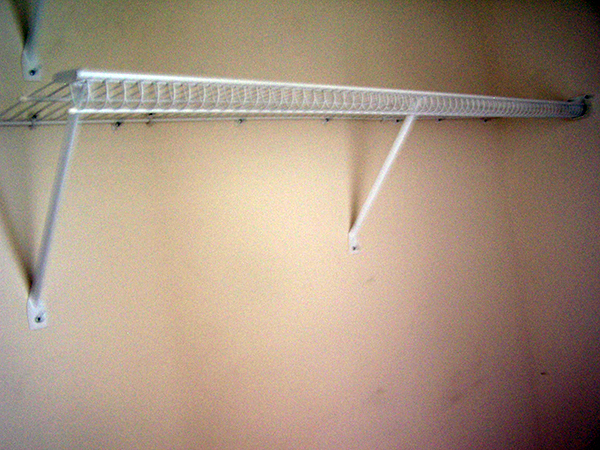 Hangers – To give your closet a uniform appearance, choose the same type of hanger throughout a section – think velvet, wood, wire, or plastic. Amazon has a great selection of clothes hangers. I ordered some and may post a picture once they come in. Garment Bags – Dresses and suits not worn often can get dusty. Garment bags are also good for storing old memento clothes like your prom dress or graduation cap/gown. For good leather storage, make sure you get a canvas garment bag since leather can dry out in plastic. 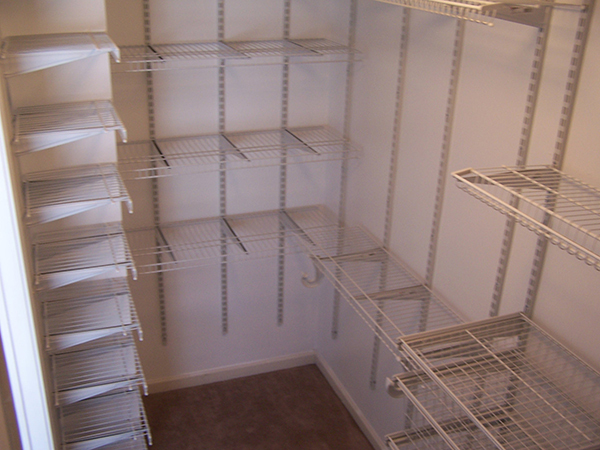 Decide on Storage – If you have a huge closet, everything might fit. 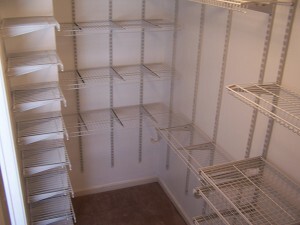 Otherwise, you need to store items you don’t use often or that are seasonal items. Accessories – Decide on organization for accessories like handbags, belts, scarves, and hats. There are some great storage solutions out there. You can also put baskets to good use for this type of storage. Shoes – Determine a system for your shoes based on your space. If you have room for a small row of shoes, it might be advantageous to purchase some clear shoe boxes for storage. If you’re on a budget, use cardboard shoe boxes but paint them all the same color – like spray-painting white. Then print a picture of the shoes to put on the end. Again, organize by type then color. Store your boxes on shelves in your closet or under the bed. Make sure that nice boots have boot shapers to keep your boots from folding over or becoming misshaped. 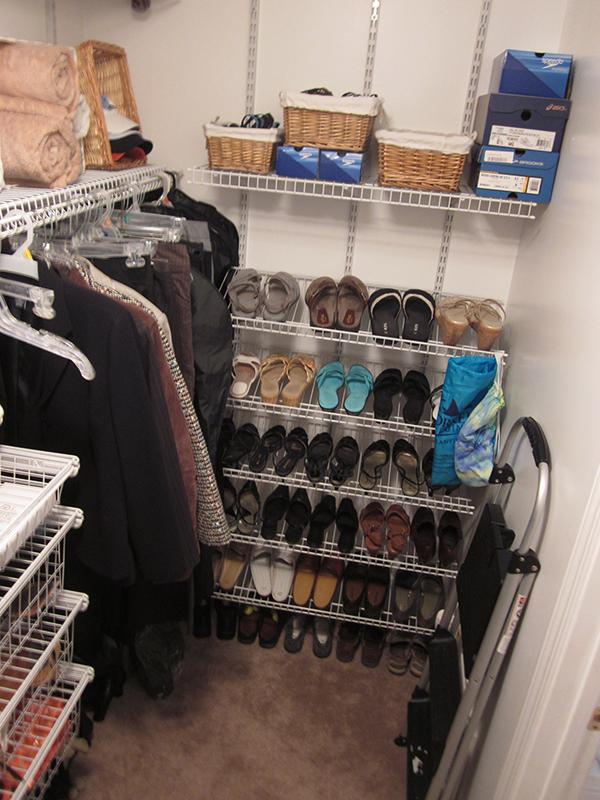 Ladder – Keep a collapsible step ladder in the closet to reach higher shelves. Once your clothes are done, you need to evaluate your jewelry and accessories. After all, accessories can make or break an outfit. Pull all your accessories out (then jewelry) and look through them. Have a trash bag handy for items that need to be thrown away. Have some cardboard boxes handy for items that will be donated. Ziploc bags are good for sorting jewelry to be donated. At some point during the donation process, it’s a good idea to photograph and list items for donation. You can do that now or later. I suggest doing it later. We have enough to do now. A Jewelry Armoire is a great way to store jewelry. It has hanging hooks for good necklaces and a lot of storage options for rings, earrings, bracelets and other jewelry. This is also a good opportunity to clean your jewelry and polish any sterling silver. You can also sell some old gold jewelry if you like. Again, make a list of any gaps in your collection.Sort by style and color. There are lots of organizational solutions for belts, hats, scarves and handbags. Baskets work wonderfully. Sort by style and color. Shop seasonally – Buy pants during winter when stores are starting to bring out spring fashion. Alternately, purchase summer clothes at the end of summer when fall fashion is being brought out for back-to-school. Buy nice jewelry after Christmas, Valentine’s Day, or Mother’s Day. Shop Frugally – Shop outlets, look for coupons, and put rewards to good use. Buy high-quality staples – Spend good money on basics like jeans, slacks, and neutral shirts. Get a quality wool dress coat. Buy some cashmere. Don’t buy the most trendy style. Get good items and have them altered to fit perfectly. High Fashion should be cheap – If you love the new style of blouses, get a few inexpensive ones. They are attention-getting so you can’t wear them all the time. They will go out of style quickly and you won’t like them in a year. Fashion jewelry should be inexpensive – Don’t overpay for cheap jewelry. 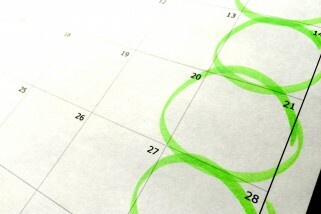 You don’t have to fill in all of your gaps right now, but it might be advantageous to fill in a few seasonally. You put a lot of work into getting organized. Make the effort to put your clothes away correctly. Put a reminder on your calendar to look through your clothes about once a year and get rid of or replace things that aren’t getting worn. To get other areas of your life this organized, check out the Organized Life Series of Articles.